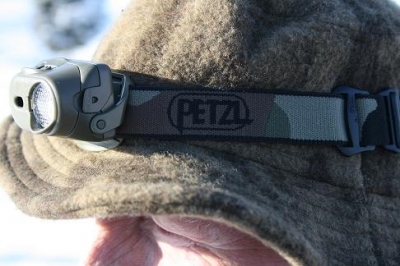 Montana Test.com - Results for: Petzl TACTIKKA XP Headlight Reviewed! Petzl’s TACTIKKA XP headlamp is a serious light with never ending features. The one we found the most intriguing is the boost up to fifty meters that is just less than 165 feet. The boost lasts just a mere 20 seconds but gives you a quick burst of light to look over your terrain and in our case, our decoy spread. The spot beam reaches 35 meters or 114 feet. If you hunt big game, the TACTIKKA XP is necessary; it is compact and lightweight and has four wide-angle lenses, red, green, blue, and transparent. With three light levels maximum, optimum, and economic with continuous and flashing. The TACTIKKA XP offers a battery charge indicator light, tracking power levels, always bring along extra batteries. All our testers appreciated the quality of the TACTIKKA XL and with most of the testing in snow and bitterly cold weather, it performed. The TACTIKKA XP headlamp comes in colors for specific outdoor activities like hunting or fishing. Its functionality, as well as its four Wide Angle lenses (red, green, blue and transparent), make this lamp perfect for the demanding user. The sliding Wide Angle lens allows the user to switch from a focused beam to a wide beam with one quick movement. This headlamp has three lighting levels for any situation and a flashing mode for signaling the user’s presence. It also has a Boost mode to temporarily increase light intensity up to 50 meters, as well as a lamp body that can easily be aimed with one hand. The battery charge indicator light allows the user to easily keep track of battery life.